The California Rodeo Salinas celebrates its 100th year of ropin’ and ridin’ and you’re invited. Mosey on down to Salinas to cheer on some of the country’s best bare back bronc riders, tie down ropers and steer wrestlers! 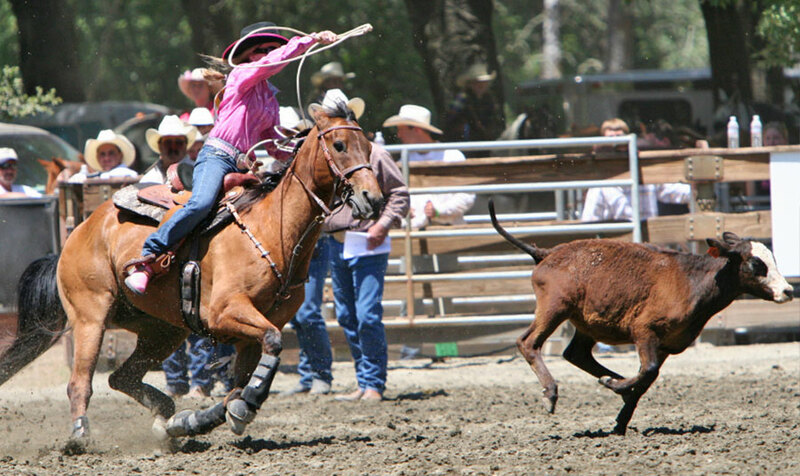 Cowgirls compete at professional barrel racing, hide races, wild cow milking, freestyle bullfights, calf dressing, mutton busting and more. But it’s not all rough-and-rowdy – come for the Cowboys & Cabernet-Cowboy Poetry & Wine Tasting on Friday, July 9th. This year’s show features renowned cowboy poet Baxter Black with Dave Stamey opening for him. The word “rodeo” is derived from the Spanish word “rodear” meaning to round up, and was the name used in the Spanish ranchero days when the semi-wild herds of cattle were gathered in the spring for branding, earmarking and gelding. The custom of branding was as much a part of range law in those days as it is today. Twice a year the vaqueros (cowboys) would ride into the wilds, with their remuda (a herd of horses from which ranch hands select their mounts), and gather as many cattle as they could find and herd them to a central location, usually a wide valley, where they could be separated by brands. If any animal made an attempt to escape, the vaqueros promptly roped it with their rawhide reatas (lariats). Or in a unique form of bulldogging, called a coleado, the vaqueros chased the cow or steer and grabbed the tail to flip it off its feet. The semi-annual roundup also served as a social gathering and celebration by the various families who lived on the enormous ranchos, some as large as 45,000 acres, where the nearest neighbors could be miles away. A rodeo could last a week or more and included barbecues, fandangos and roping and bronco riding competition among the vaqueros. For more information, please visit http://www.carodeo.com or call toll free: (800) 771-8807.